An important aviation centre from the 1930s, Hatfield was home to the London Aeroplane Club, the RAF Flying Club, the Stage and Screen Aero Club. It hosted many key aviation competitions. Over the years many of the great names in aviation history (and associated fields) have visited Hatfield. Below are just a few of them (in alphabetical order). However, while not all were famous but it does not diminish their contribution to the Hatfield story in any way. Flight Lieutenant Edward Gordon Brettell DFC was a racing driver turned Spitfire pilot. He flew with 92 Squadron, and with 133 Eagle Squadron before being shot down and becoming an important member of The Great Escape team – and was murdered on Hitler's orders. In a surprise raid a single Junkers Ju88 dropped a stick of bombs on the factory killing 21 and wounding around 70. Six of the casualties are buried in a mass grave in St Luke's Churchyard. All 21 are listed on the town war memorial. The October 1940 air raid appears to have been an unplanned target of opportunity strike (due to bad weather – the intended target is thought to have been Reading). However, once the Germans learnt the power of the DH.98 Mosquito they decided to attack – this time with their feet planted firmly on the ground. 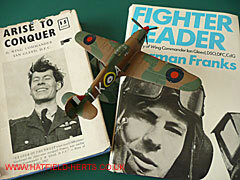 More information can be found under Claims to Fame and the Hatfield in WWII feature. This WWII fighter ace saw action in the Battle of France, Battle of Britain, and later over the Channel and Continental Europe as the RAF took the fight to the foe. He was killed in action in North Africa in 1943. But his first flight was from a peaceful Hatfield. While Hatfield is known for its contribution to heavier-than-air flight, its first brush with manned flight happened centuries earlier. The first man to fly a plane over Hatfield went on to become a legend. His wife, a passenger on one of his historic flights also became a pilot. His son followed in his father's footsteps – to glory and a tragic end. John Stroud spent part of his childhood in Hatfield and watched aviation come to the town. He later got a job with Imperial Airways and devoted the rest of his life to aviation. Apart from his skill as an artist, he also became a renown aviation writer. First as a child then as an adult John Stroud witnessed many of the key aviation developments and events that form Hatfield's aviation heritage. An article detailing his memories was published in 1975 (and is reproduced here by courtesy of Key Publishing, publishers of aviation titles like Aviation News and FlyPast). Hatfield's position at the cutting edge of aviation led to several visits by British and overseas Royalty. Some even learned to fly here. The story of one of the many individuals from overseas (in this case Sri Lanka) who came to Hatfield, and went on to achieve great heights in their home countries. It is also a reminder that Britain did not stand completely alone against Nazi ambitions. More information can be found in the Claims to Fame section.